Sigh, a friend who constantly goads me in regard to all matters pertinent to President Trump has threatened me with physical violence if the Big Red Car fails to take note of the Mueller Report. I will try to restrain myself from discussing much of the detail, but I will touch on the process. 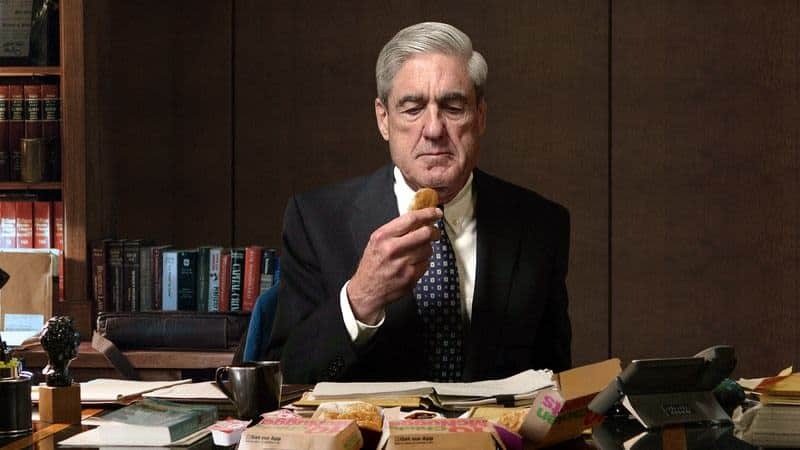 Robert Swan Mueller III investigating President Trump’s McDonald’s selections. Two years later, we now have the Mueller Report. The charge then morphed into an investigation of whether the President obstructed justice. The charge to look at obstruction was focused at first, but then ran far afield during the course of the investigation. I take issue with the process. Let us map the process, shall we? President Trump invited thought leader and Congresswoman Alexandria Ocasio-Cortez to lunch at the White House so they might get to know each other. The Big Red Car was allowed to sit in and listen to their conversation. AOC arrived at the porto cochere in a black SUV that gets seven miles per gallon in city traffic. As she stepped down, she mounted the stairs and waved to the crowd on the other side of the drive. It was actually three members of the White House grounds crew who had been blowing leaves off the driveway. They waved back at her. President Donald J Trump met her at the door — he was a little late — and welcomed her to the White House. “Have you ever been to the White House?” he asked, holding her hand. “No, but I will live here one day.” She broke into laughter, riotous laughter. I have written a bit, but not much on the entire Russian Collusion escapade. Punch in “Mueller” in the search box to the right of this post and you can read those posts. So, in response to my pal, I will offer the following observations. OK, so I tipped my hand a bit, didn’t I? But I have a serious observation or two. Today, we have the great honor and high privilege of talking to Former FBI Director Robert Swan Mueller III after the delivery of his report to the Attorney General. We caught up with Director Mueller at brunch after he went to church across Lafayette Park from the White House. Here he is trying to remember where he parked his car. A gray, rainy day in the ATX — a good day to trim trees? So, lately we’re been hearing a lot of talk about the Twenty-fifth Amendment to the US Constitution. Let’s do some research, shall we? Here’s a picture of the Founding Fathers in Philadelphia hammering out the Constitution. The US Constitution was drafted over a period of 116 days from 25 May 1787 to 17 September 1787. The American Revolution ended on 3 September 1783. It took a long time to finalize the Constitution and it had a provision to amend it. First, contrary to the talking heads, the 25th Amendment was not the work of the Founding Fathers. I listened to an idiot on Fox News for half an hour talking about what the Founding Fathers intended. The 25th Amendment was submitted to the states on 6 July 1965. It was ratified on 10 February 1967. Big news today, y’all. Your Big Red Car has snagged an exclusive interview with the Speaker of the House of Representatives, Nancy Pelosi. Nancy Patricia D’Alesandro Pelosi is the 78-year old Speaker of the House for a second time. She represents approximately 80% of the City of San Francisco (if people are taking a dump on your block, call Nancy) and has served in the Congress since the Holy Ghost was a Private First Class. We met at a coffee shop in West Austin where she was nibbling a croissant and drinking a “shot in the dark” — three shots of espresso in a black cup of coffee. Big Red Car here on a sunny Christmas Eve awaiting Christmas and the Prince of Peace which brings me to the subject of generals, politicians, and wars. Generals are at the top of their profession which is to wage war against the enemies of the United States and WIN. Resigned Secretary of Defense James N Mattis, former USMC General. The part about winning is an essential element in the General business. So, the Big Red Car scored an exclusive interview with Jim Acosta of CNN. You will recall that he recently was put in timeout by the Trump administration for misbehaving at a Presidential press conference. In case you don’t know who he is, here is a picture of Jim at the White House before a press conference. As we are headed to print, a Federal Judge has ruled that too many people are being mean to Jim and that he should get his press pass back because he’s nice enough. Canadian Softwood Lumber Tariff — what ever happened? Big Red Car here on a drippy and rainy gray ATX day. It has been raining for almost a month. Today, we talk about what really happened by the imposition of the Canadian Softwood Lumber 20.8% tariff back in May 2017. Of course, the Canadians and the Americans – National Association of Home Builders – immediately began to cry foul predicting that the price of a US home would go up by $9000. Now, of course, we have some firm evidence as to what did happen. In fact, after hitting a peak of $653 per thousand board feet, the current price of lumber is $313.40/thousand board feet. That’s right lumber has gone DOWN after the imposition of the tariff. Here is the price of a thousand board feet of lumber from the inception of the tariff until today. Big Red Car here down in the Oil Patch of Austin By God Texas. OK, no oil wells in Austin, but I can get to some in half an hour. Today, we talk about oil in the United States.